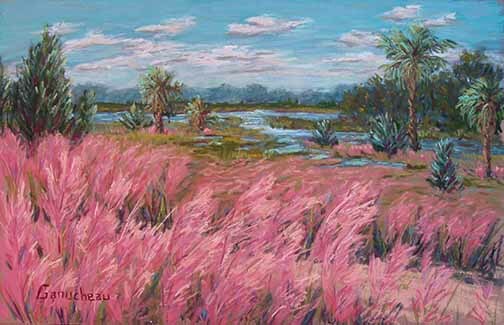 Pastel painting by Rose Ganucheau of Purple Muhly grass at Helen Floyd Park, located near Mayport, Jacksonville, Florida. Painted on an outing with the First Coast Plein Aire Painters to Helen Floyd Park. 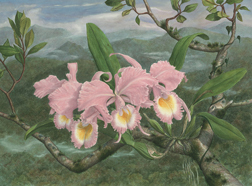 The park is situated on a spit of land that follows the south shore of the St. John's River, close to it's mouth. Surrounded by water vistas in all directions; rivers, marshes and estuaries, it was hard to decide which way to park the easel. The Purple Muhly grass was dense and in full bloom everywhere. I finally chose a direction which back-lit the grass emphasizing it's pink-purple hue. I was overwhelmed by the mass of color and couldn't help but think of Monet's Poppy paintings.